Spring is coming! 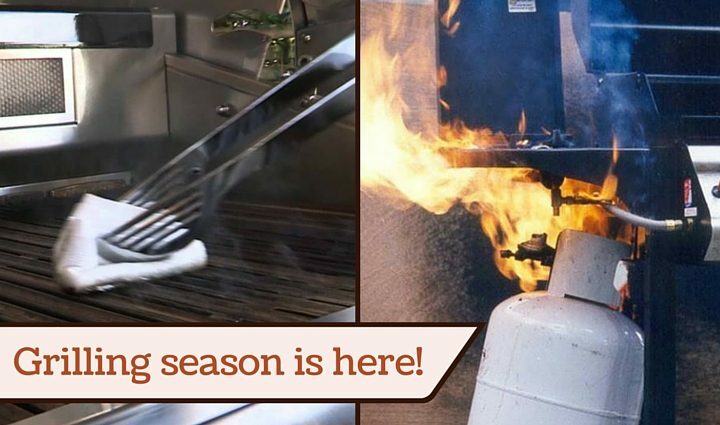 The snow is thawing and trees are budding, and that means one thing – grilling season is here! It can be tempting to fire your grill up as soon as it’s been freed from its snowy prison, but after sitting idle through the cold winter, your grill will appreciate a little TLC before you stoke the flames. Mix a 50/50 solution of soap and water. Brush the solution onto your gas hose and any connection points. Open your gas supply. If there are leaks, you will see bubbles forming at the source of the leak. If you see bubbles coming from a connection point, disconnect and reconnect your hose to make sure things are fitting properly and that connections are not cross-threaded. Run the test again. If you still see bubbles, tighten the gas hose and regulator. You can tighten the regulator and gas tank using your hands, but you should use a wrench to tighten the gas hose and manifold. During the cold winter months, spiders like to make a warm and cozy home in your grill’s venturi tubes. 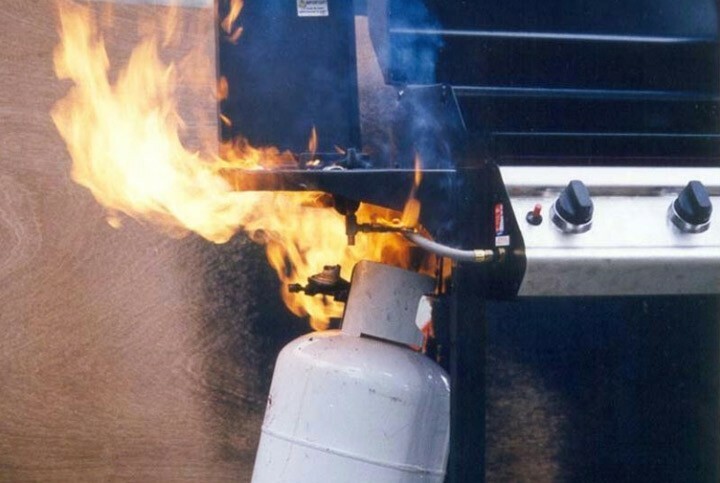 These tubes supply heat to your burners, and if spiders or other insects have infiltrated your grill, they can obstruct the flow of gas and cause uneven flames or even flashback fires. 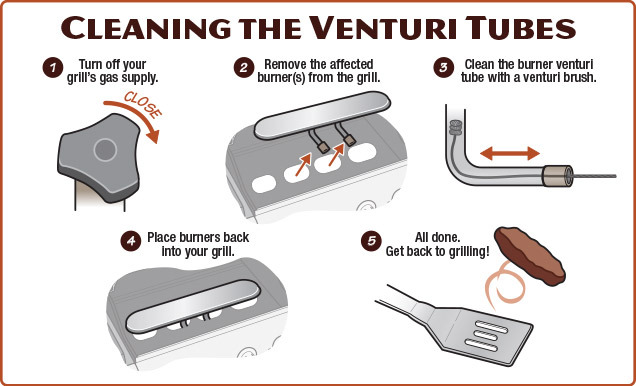 If you find a blockage in your venturi tubes, you can clean them out using a special venturi brush. Batteries discharge more power in colder temperatures, so be sure to test your igniter’s batteries before you start your grill for the first time. If your igniter isn’t working, the solution may be as simple as replacing the battery If a new battery doesn’t get things going, check that the electrodes are secure at the back of the igniter button and the ignition module, and that there is no damage to the igniter wires. To check if your propane tank is full, place it on your bathroom scale. A full 20 pound tank will weigh between 37-38 pounds, while an empty tank will weigh closer to 18 pounds. Scrub the cooking grates, heat plates, and warming racks with a grill brush, then wash with warm, soapy water. Dry thoroughly. Apply a coating of vegetable oil to your cooking grates to create a non-stick coating. This is especially important for cast-iron grates, which will rust if you don’t protect them properly. Remove the grease tray and wash with warm, soapy water. Wipe down the inside of the grill cabinet to remove any food particles or other debris. Rinse the outside of your grill with a solution of vinegar and water. For tougher spots, use a specially designed grill cleaning solution. Once your grill is in tip-top shape for grilling season, there’s nothing stopping you from creating culinary masterpieces all summer long. Grill parts designed specially for your grill brand can help prolong the life of your grill. Grill Spot carries replacement parts for over 100 grill brands. If you need replacement parts, find your brand.